"H'el on Earth": "Lost Son of Krypton"
Superman and Supergirl have brought the Kryptonian two headed Tripodal Curosiananium dragon to the Block for Doctor Shay Veritas to study. Veritas is fascinated by the creature and its contributions to xenobiology. She even wants to take scans of Kara, but she refuses. The Maid of Maid does not trust many humans. Plus, her previous experiences with laboratory tests make her weary of scientists. Supergirl's only friend, whom she checks on after leaving the Block, is Siobhan Smythe. However, she is having her own difficulties controlling her Silver Banshee abilities, as we see once Kara has left to return to the Sanctuary. Whether she will be friend or foe for the Girl of Steel is anyone's guess at this point in time. Sanctuary has revealed to Kara something that she always suspected, but didn't want to believe. Superman really is her baby cousin Kal-El. Suddenly, she begins to yawn. Feeling tired is something new for Supergirl. Yet, she does not fight it. The Lost Daughter of Krypton awakens on the surface of Earth's yellow sun, where she meets H'el, a bare-chested being dressed in garb similar to Kal's. His intentions for Supergirl are unclear, but they will surely put all of her great powers to the test. The scarred alien H'el claims to have been sent by Jor-El before Krypton was destroyed. He had watched over Kara and Kal-El from afar. Now, as the pair witness humans going to war, H'el is offering Supergirl a chance to return home to save her planet. To prove his sincerity, H'el gives the Maid of Might the unconscious form of Superboy. All Kara must do is decide one thing. Should the clone called Superboy live or die? The choice of whether to kill Superboy is a difficult one for Kara. She wants to speak with Kal-El before such a thing can be done. For this, H'el gives Supergirl the gift of understanding human speech and transports her to Metropolis. However, her arrival is ill timed as Kara Zor-El walks in on a conversation between Lois Lane and Clark Kent. To Be Continued in Superman #14. Story - 5: Admittedly, I was ready to give this issue a lower rating as I was particularly prepared to rip "H'el on Earth" to shreds. 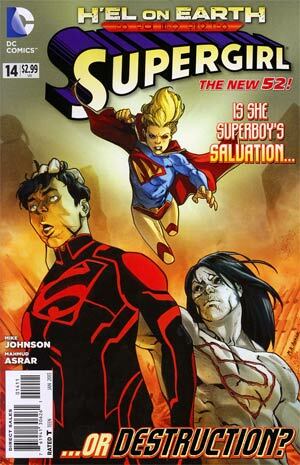 I have had a love/hate relationship with crossovers recently, and the Superboy chapter was decent, but sluggish. Superman #13 was okay in spite of its flaws. Frankly, I expected more from both books. Supergirl #14 doesn't make up for their shortcomings. Yet, it does give us some incredible storytelling and wonderful character moments for Kara. Like Adam Dechanel, I'm not the biggest fan of the Doctor Veritas character. I don't want to see her the pages of Supergirl too much. Veritas feels like a poorly recycled version of Emil Hamilton. However, her appearance does not diminish the quality of what is an entertaining book. Is H'el the New 52 Bizarro or Eradicator? It's too soon to tell at this point in "H'el on Earth". If the remaining chapters are as good as this one, I look forward to finding out the answer to my question. Let's hope this arc does not disappoint. Art - 4: This issue really shows off many of Mahmud Asrar's strengths as an artist, particularly alien/monster/sci-fi/horror motifs. Yet, it also shows his greatest weakness in my opinion. His Clark Kent and Superman look strange to me for some reason. This throws the book off a bit in the visual sense. Still, Asrar has done a bang up job with everything else so far. Cover Art - 5: I may have stated in the past that I prefer covers that give an indication of what's going on in the comic book rather than the iconic images that could serve as a poster. Mahmud Asrar tends to do the former rather than the latter, giving the art a retro sensation of something that came out in the Bronze Age. That's always a positive aspect for me.